Just west of downtown Chicago lie the charming old towns of the scenic Fox River Valley. An experienced winemaker guide accompanies you to three tasting rooms featuring wines made from grapes grown in the unique ‘terroir’ of Illinois and other Midwest states. 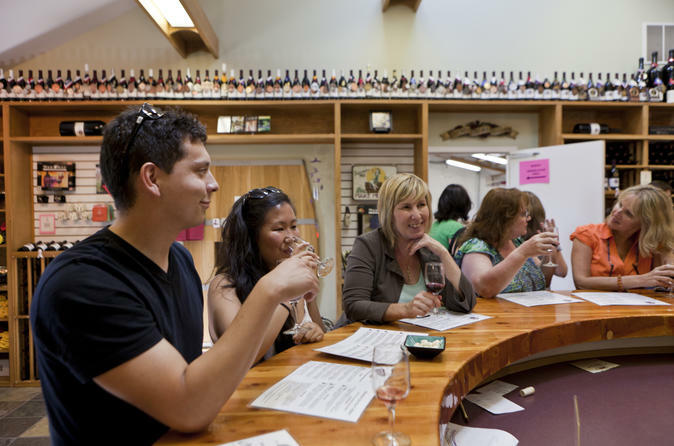 Sample up to seven wines at each stop and enjoy a gourmet lunch. At the conclusion of the tour, you can be dropped off at select Chicago hotels. Meet at the InterContinental Chicago Magnificent Mile and settle aboard a 12-passenger, air-conditioned van with individual seating. You’ll head out of downtown to the western suburbs of Naperville, Aurora, Geneva, and St. Charles for a full-day of wine tasting in the Fox River Valley. Your guide — an experienced winemaker and licensed wine distributor who knows the winemakers at each of three wineries you will visit — shares intimate knowledge of the hybrid grapes that are used in the Midwest wine industry. At each tasting room, receive up to seven tastings and spend 45 minutes learning about the wines that these wineries produce. A leisurely gourmet lunch is provided along the way; your small group can choose from a variety of cuisines. Tasting fees, snacks, and bottled water are also included along with drop-off at your hotel.